Short-term sleep deprivation shown to affect heart function. Sleep deprivation is the condition of not having enough sleep; it can be either chronic or acute. A chronic sleep-restricted state can cause fatigue, daytime sleepiness, clumsiness, and weight loss or weight gain. It has also been shown to adversely affect the brain and cognitive function. Now, a study from researchers at the University of Bonn shows that 24-hour, shift-related, short-term sleep deprivation leads to a significant increase in cardiac contractility, blood pressure, heart rate and stress hormone secretion. The team state that cardiac function in the context of sleep deprivation has not previously been investigated with cardiovascular magnetic resonance (CMR) strain analysis, the most sensitive parameter of cardiac contractility. The study was presented at the annual meeting of the Radiological Society of North America (RSNA). Previous studies show that people who work in fire and emergency medical services, medical residencies and other high-stress jobs are often called upon to work 24-hour shifts with little opportunity for sleep. 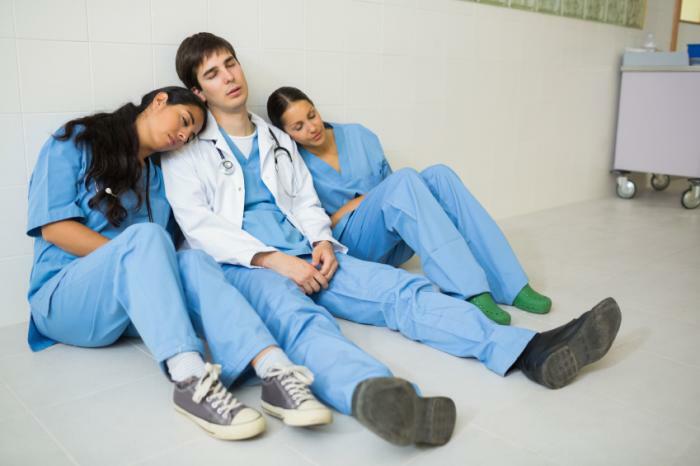 While it is known that extreme fatigue can affect many physical, cognitive and emotional processes, no study has examined how working a 24-hour shift specifically affects cardiac function. The current study shows that short-term sleep deprivation in the context of 24-hour shifts can lead to a significant increase in cardiac contractility, blood pressure and heart rate. The current study recruited 20 healthy participants, including 19 men and one woman, with a mean age of 31.6 years. Each of the study participants underwent CMR imaging with strain analysis before and after a 24-hour shift with an average of three hours of sleep. The lab also collected blood and urine samples from the participants, as well as measuring blood pressure and heart rate. Results show that following short-term sleep deprivation, the participants showed significant increases in mean peak systolic strain, systolic and diastolic blood pressure, as well as an increase in their heart rate. Data findings show that the participants had significant increases in levels of thyroid stimulating hormone (TSH), thyroid hormones FT3 and FT4, and cortisol, a hormone released by the body in response to stress. The group note that their study was designed to investigate real-life work-related sleep deprivation, and while the participants were not permitted to consume caffeine or food containing theobromine, such as chocolate, nuts or tea, they did not take into account factors like individual stress level or environmental stimuli. They go on to add that although they were able to perform follow-up examinations on half of the participants after regular sleep, further study in a larger cohort is needed to determine possible long-term effects of sleep loss. The team surmise their findings show that following short-term sleep deprivation, increases in systolic and diastolic blood pressure, heart rate as well as peak systolic circumferential strain and peaksystolic longitudinal strain were revealed. For the future, the researchers state as people continue to work longer hours or work at more than one job to make ends meet, it is critical to investigate the detrimental effects of too much work and not enough sleep. They conclude that these findings may help the global medical community to better understand how all types of workload and shift duration affect public health.